These beautiful rose-coloured tubers are oca, or new Zealand yams (Oxalis tuberosa). Once an unusual novelty item, they are now offered by a number of mainstream vegetable suppliers, often promoted as a blight-free substitute for potato. I think it will take more than pretty pink skin to supplant the potato in British gardeners' affections, but I found oca to be a versatile addition to the kitchen garden and notably trouble-free to grow. They are also rather romantically known as the Lost Crop of the Incas, and like potatoes, they do indeed hail from South America. The name New Zealand yam was given to them because they have been commercially cultivated in NZ over the last 20-30 years and has nothing to do with their origins. These are often described as tasting like lemony potatoes. Unlike potatoes, however, they can be eaten raw, with a crisp, crunchy flavour. Cooked, they have a texture not dissimilar to a waxy new potato, but the lemon notes are much more muted. They remind me also of Jerusalem artichokes, though without the flatulent after-effects. They also have another advantage over the Jerusalem artichoke - they don't need peeling. Suppliers include Real Seeds, which has a number of different varieties available, so you can experiment with red, yellow or pinkish coloured tubers. The site characteristically also has plenty of useful information on how to grow and maintain the crop. Your oca will arrive as tubers, like potatoes or Jerusalem artichokes, in March. Last year I potted them up and kept them in the frost-free patio greenhouse while I figured out where to grow them on. They should not be planted out in the open ground until after the last frost. I planted my five tubers out in April in a spare row at the bottom of the potato bed, so in a well-drained soil with some organic matter dug in, though they seem to be fairly unfussy in their soil requirements. They don't really need earthing up and quickly grow into a low shaggy bush with shamrock-shaped leaves. A bit of routine weeding and watering in a dry spell should keep them happy. As the nights draw in during autumn, you start playing a a kind of cat and mouse game with the prospects of frost. 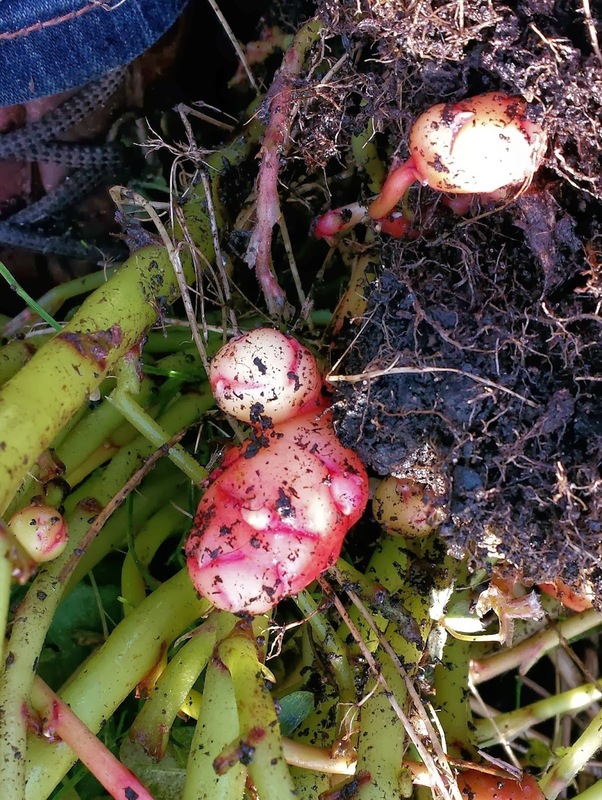 Oca plants aren't frost-hardy, but the tubers don't start to swell until the days get significantly shorter in autumn, and need as long as possible to grow to full size. In October I dug up one plant out of curiosity and found nothing. But by the end of November, I found lots of plump little tubers definitely worth harvesting – with a delicious nutty flavour with that hint of citrus. If you do get a light frost, and assuming that in October/November this won't a be a deep, hard freeze, the tubers can be safely left below ground to swell up further, even though the leaves will wilt and look frostbitten. You can also protect the plants with fleece in order to prolong the season. 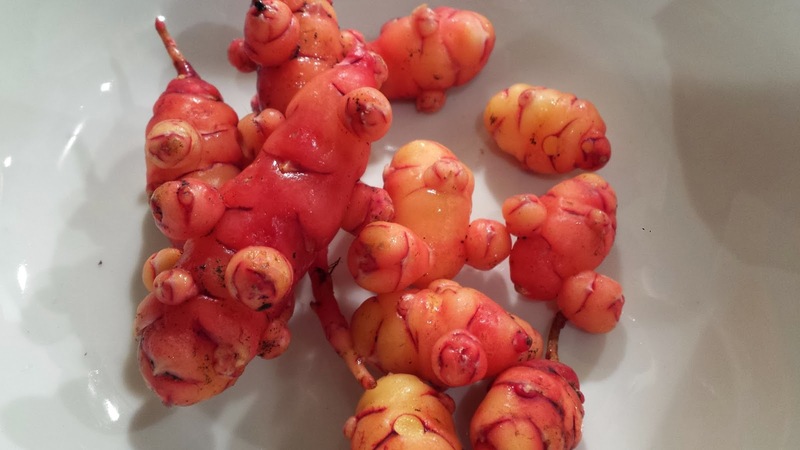 The blog Growing Oca also has some good oca cultivation tips, especially on managing this end of season period, and keeping the tubers growing. Finally, you should remember to keep some good-sized specimens back to replant the next spring - no need to keep ordering new tubers every year. Put the saved tubers in a pot somewhere cool but frost-free and cover with dry or just-damp compost. For even more details on oca, the author at downtheplot.com has been growing oca since 2007 and has shared his experiences on how to maximise oca yields. Digging up tubers at the end of November. Hi, this is Sarah who used to hold Kirstens keys. A friend is looking for someone to help re her front garden being sorted was wondering if you might be interested? Kirsten may still have my email.